Since 1989, when redevelopment of the incredible V & A Waterfront began, the fair face of Cape Town has changed immeasurably. Ageing is not for sissies, yet Cape Town’s façade is improving and becoming ever more pleasing, day by day, and year by year. If change is a constant, Cape Town’s V & A Waterfront most certainly bears evidence of constant, ongoing change – for the better. The V & A Waterfront is chock-a-block with wonders. Irrespective of your age, you’ll never be bored, always finding something or somewhere that fascinates you. The once tatty, enclosed dockland has become a shining star on the Cape Town scene. Before we mention one of the newest attractions, let’s consider the overriding fascination with and use of abbreviations that have become so commonplace in some English-speaking countries. Like so many other practices that seem so prevalent nowadays, the ubiquitous use of such abbreviations probably originated from the Americans. They have the FBI, CIA, NASA, and the like. South Africans have followed suit, taking to abbreviations like ducks to water. There’s the NPA, NEC, and SARS, to name a few. The Zeitz MOCAA at the V & A Waterfront is another. This world-class facility – the Zeitz Museum of Contemporary Art Africa – only opened its doors in the latter part of 2017, so it really is brand spanking new. The harbour area was redeveloped to create the V & A Waterfront, and so too was the Zeitz MOCAA, which was previously a grain silo built in 1921 and mothballed in 2001. The Zeitz MOCAA is said to be the biggest museum of contemporary African art in the world. There are no “rights” and “wrongs” when viewing art – one of the joys of appreciating contemporary works. You’re expected to be subjective. Take a wander through the wonders of the waterfront. You’ll need more than a couple of days to experience everything that awaits you. Why not start with the latest innovations, like the Zeitz MOCAA, and work your way chronically backwards to understand all that went before? Remember to allow time for one of our sunset cruises too. 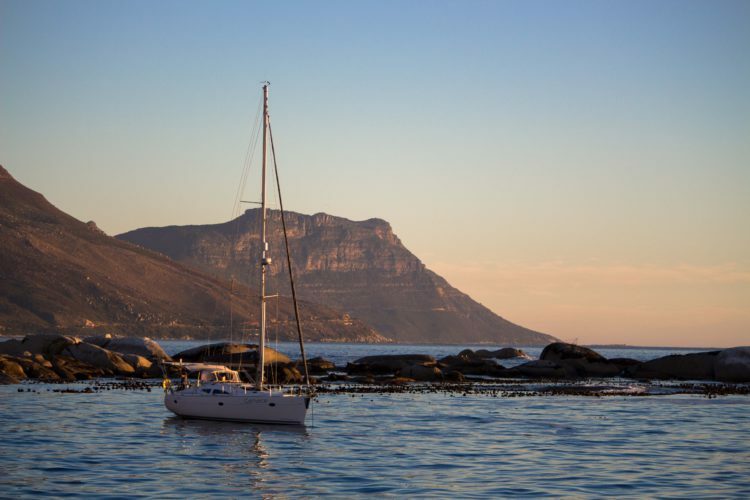 We’re also based at the waterfront, and a sensational sunset cruise is the perfect way to end a day at the V & A. The pundits say: “You must know where you came from to know/understand where you’re going”. The V & A Waterfront and its wonders are going places, and so are you, on your charter sunset cruise.